Every winter my kids want to build an igloo outside. And every year, we fall short. Either we don’t have enough snow, the weather is too frigid, or we just can’t make it look like the real thing. Also, snow forts are not entirely safe either. 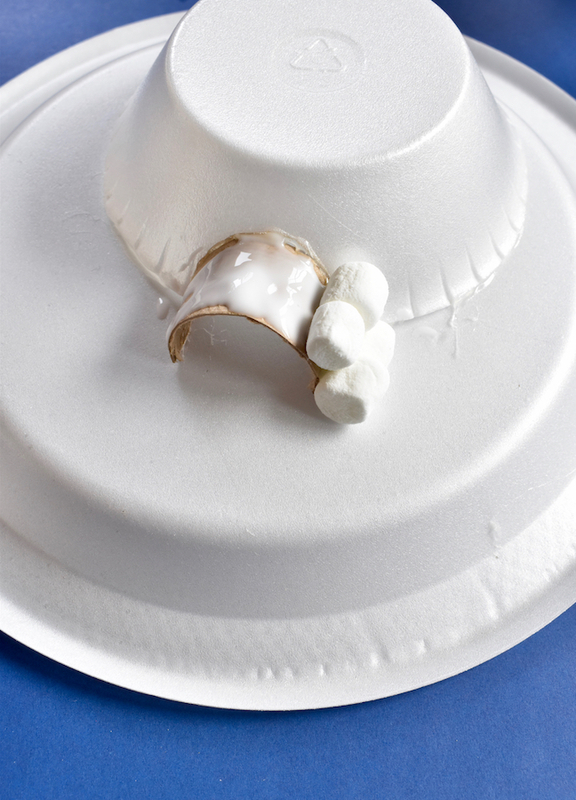 So, I found an alternative way my kids can build igloos, and it’s with one of their favorite, gooey treats; marshmallows. 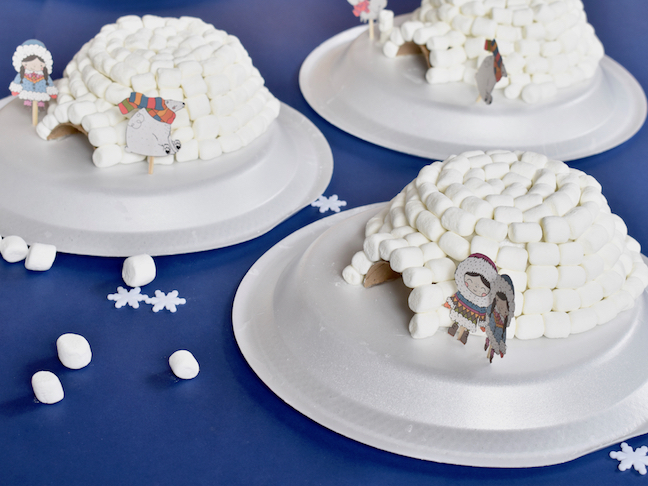 Yes, we made DIY marshmallow igloos! 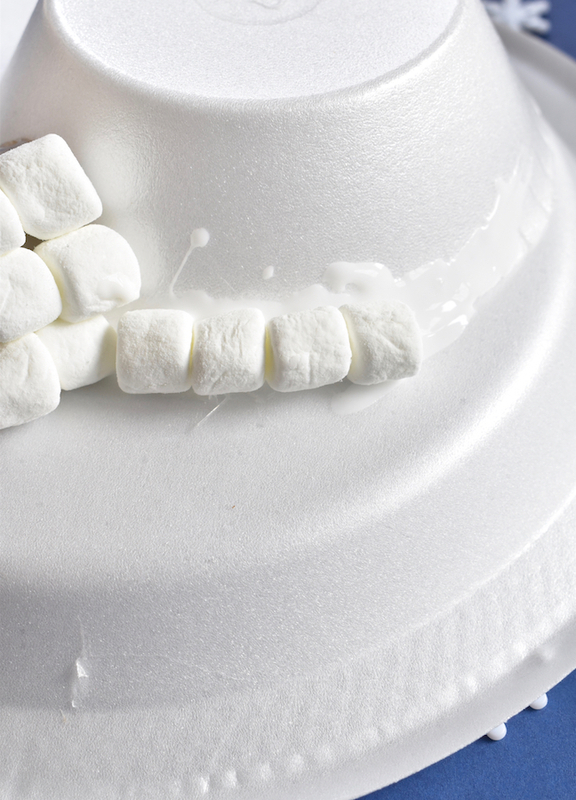 Now, I used glue to secure the marshmallows on, but if you are looking to make this into a candy house style project, you can certainly use edible icing. The best part is, no gloves are required (and you won’t hear the kids whine that it’s too cold). 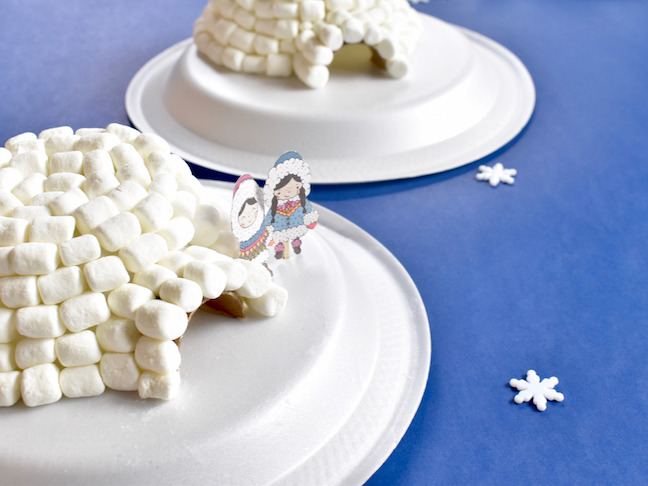 You can craft these marshmallow igloo masterpieces inside, where it’s nice and warm. This will keep your kids busy while they are home for holiday break. Step 1: Cut around the foam bowl so there is no flat edge. 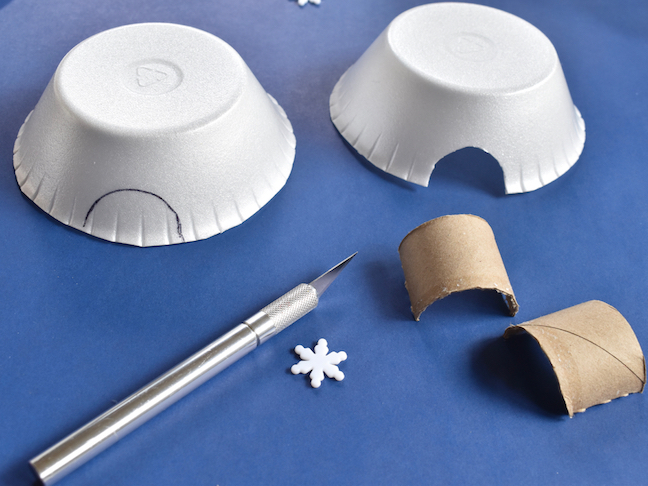 Cut a toilet paper roll into 2-3 inch pieces with the Xacto knife. Next, slice each of those pieces in half. At this point, you should have mini arches. 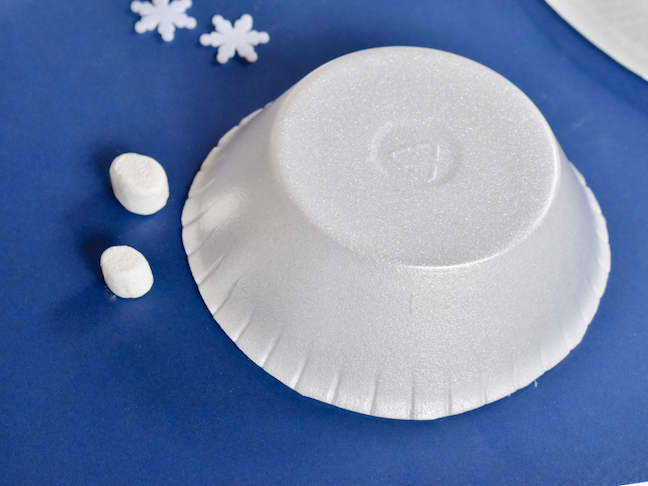 Step 2: Trace the shape of the dome against the foam bowl, and cut it out. 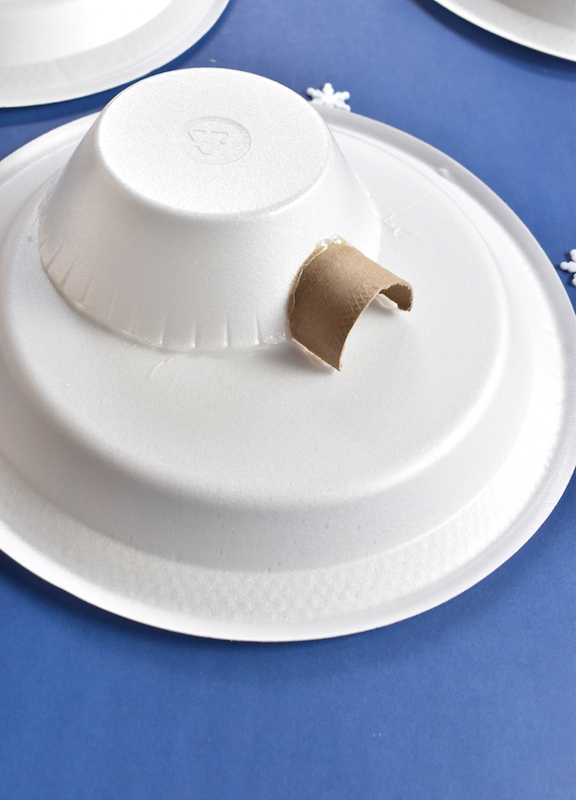 Now, you can slide the arch into the bowl, and hot glue it in place. This is the entrance to the igloo. Step 3: Hot glue the igloo to the bottom side of a foam plate. Step 4: Now comes the fun part – the marshmallows! 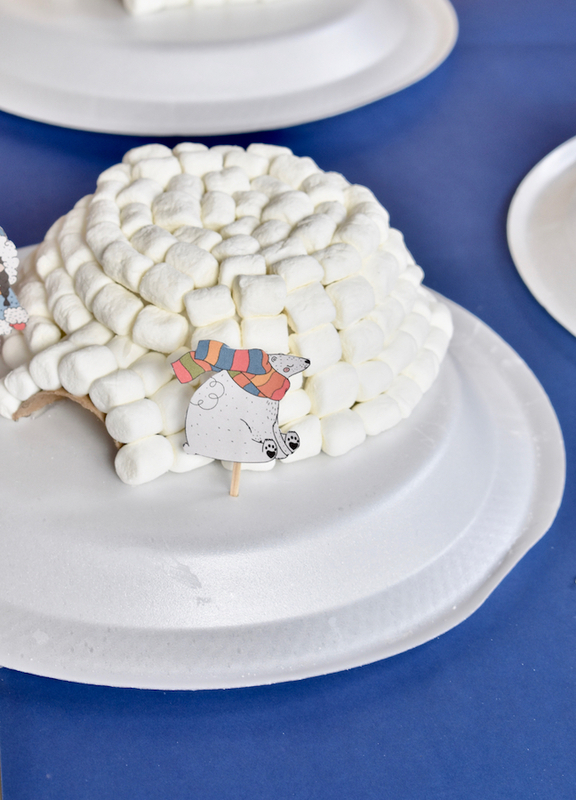 Begin by covering the entrance to the igloo with Elmer’s glue using the popsicle stick, and glue marshmallows onto it in a horizontal pattern, and then stack the layers. I set some ground rules with my kids because I didn’t want them to sick from eating too many marshmallows as they built. They were not allowed to eat all the marshmallows at once; they could only eat one marshmallow after they completed each row of the igloo, and then another five when it was finished. It was so fun, a minimal sugar high, and they loved it. 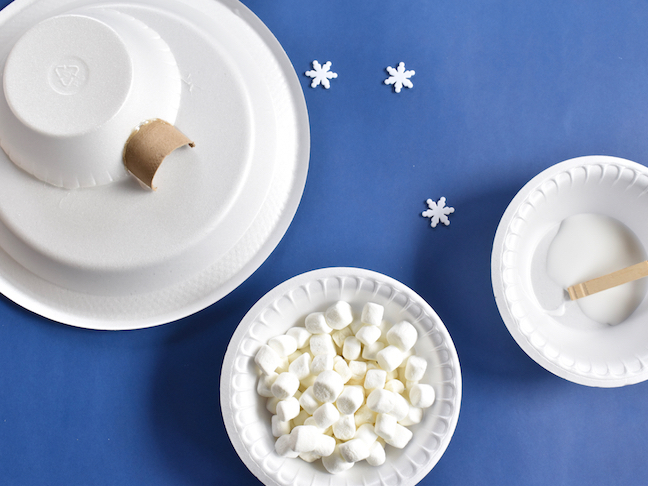 Step 5: Next, use the popsicle stick to add glue along the bottom edge of the bowl, and stick marshmallows on it one by one until the entire bottom layer has a horizontal row of marshmallows. 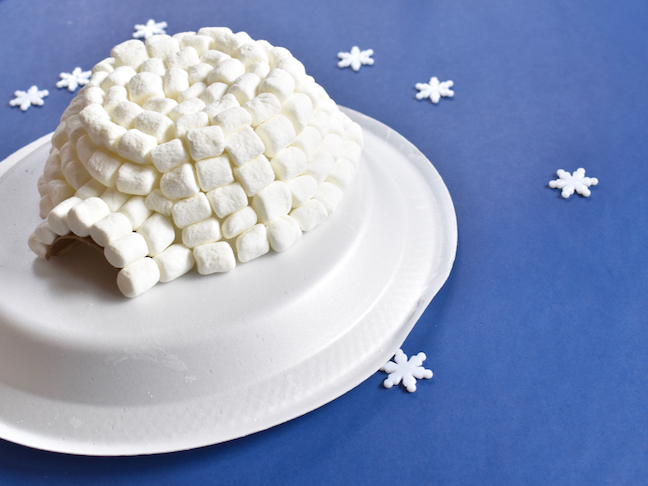 Step 6: Continue to add marshmallows layer by layer until the entire thing is covered. Step 7: My kids really loved the igloo, and asked to make more. They also wanted to learn more about Eskimos, and what the igloos were built for, so we read more about it. 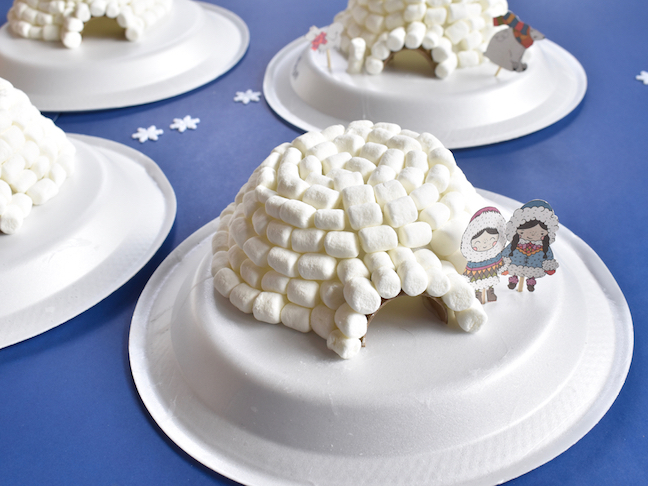 Then, we cut out cute images of Artic clipart and Eskimo illustrations (available for $2 from La Petite Market on Etsy here), and the kids glued them to sticks and set them on their DIY igloos plates.